The results of U–Pb dating of detrital zircons extracted from rocks of the Ai Formation are presented. A provenance-signal of a local source with an age of about 2.07 Ga has been documented, and the effect of the Ordovician magmatic episode on the sedimentary sequence has been revealed. 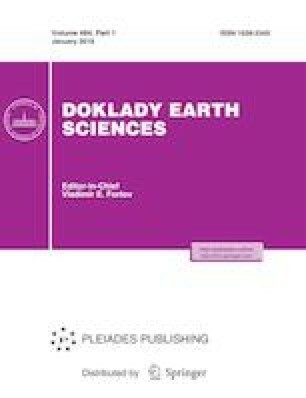 This study was carried out within the framework of State Tasks of the Schmidt Institute of Physics of the Earth, Russian Academy of Sciences, the Geological Institute, Russian Academy of Sciences (project no. 0135-2016-0009), and the Institute of Geology, Ufa Science Center, Russian Academy of Sciences (project no. 0252-2014-0002). The performance and processing of isotope analyses were financially supported by the Russian Science Foundation (project no. 14-27-00058). Geological materials for the Urals and East European Platform were collected within the framework of project no. 14.Z50.31.0017 of the Ministry of Education and Science of the Russian Federation. Publication was supported by the Russian Foundation for Basic Research, project no. 16-05-00259.